April 2, 1945 - While conducting night maneuvers near Okinawa, the USS Franks (DD-554), collides with USS New Jersey. April 2, 1984 - USS New Jersey departed the Beirut Operations Area and proceeded to Naples, Italy. During the preceding 191 days, she spent 178 days on station in the Eastern Mediterranean with a condition of readiness III or higher. April 3, 1969 - Her Vietnam tour complete, USS New Jersey departed Subic Bay enroute to Yokosuka, Japan for a two-day visit, sailing for home on April 9th. Her homecoming was delayed when on April 15th, while USS New Jersey was still at sea, North Korean jet fighters shot down an unarmed EC-121 "Constellation" electronic surveillance plane over the Sea of Japan, killing its entire crew. A carrier task force was formed and sent to the Sea of Japan and USS New Jersey was ordered to return to Japan, arriving back at Yokosuka on April 22nd. She immediately put to sea in readiness for what might befall, but as the crisis lessened, she was released to continue her voyage home. April 6, 1968 - USS New Jersey's third career began when she was recommissioned at the Philadelphia Naval Shipyard, Captain J. Edward Snyder in command. She was fitted with improved electronics and a helicopter landing pad and with her 40-millimeter guns removed, she was tailored for use as a heavy bombardment ship. April 16, 1951 - USS New Jersey sails from Norfolk to make her third transit through the Panama Canal enroute to Korea for her first tour of duty there. April 23, 1953 - At Songjin, USS New Jersey scored six direct 16-inch hits on a railroad tunnel and knocked out two rail bridges. Battleship Sailor on your Shopping list, click Here. Form you can print and return click Here. for information about visiting click Here. Celebration on October 15, 2001 click Here. onboard the USS New Jersey click Here. For Information on joining the Crew click Here. Volunteer Day onboard click Here. Air & Space Museum Annex click Here. Governor�s Award for �Mobilization of Volunteers." To date over 650,000 volunteer hours have been logged for tours, renovation and maintenance work. Bravo Zulu to the crew, keep up the good work! parts raid before she was scrapped click Here. our readers. To read the current or past issues of The Jerseyman click Here. Welcome to the Online Home Port of the Battleship New Jersey.� The USS New Jersey completed her Final Voyage home from Bremerton, WA to the former Philadelphia Naval Ship Yard, arriving appropriately enough, on Veteran's Day 1999.� The Navy's decision of where to permanently berth the Battleship was announced on January 20, 2000, and the winner was... Camden!! !� On July 27, 2000 she was moved to the South Jersey Port Corporation's Beckett Street Terminal, where she remained for about 2 weeks.� While there she was opened to the public for Deck Tours on August 9th & 10th, and drew an estimated 11,000 visitors.� She was moved again on August 15, 2000 to another dock, the Broadway Terminal, where she underwent a year long, $7.3 Million restoration.� Finally, on September 23, 2001 she was moved to her new permanent home on the Camden waterfront.� She was officially opened to the public for tours on October 15, 2001. This site contains lots of information about the USS New Jersey, the Navy's most decorated Battleship, including the Ships History, Battle Record, and Iowa Class Statistics. It also contains information about how you can help with her ongoing restoration and operation and also fund the construction of a permanent onshore museum. If you are a New Jersey Resident there are several easy ways you can help and there are also other ways everyone can help.� I myself belong to the the Home Port Alliance, they are the organization that currently has control of the ship and have opened her as a Museum on the Delaware River. 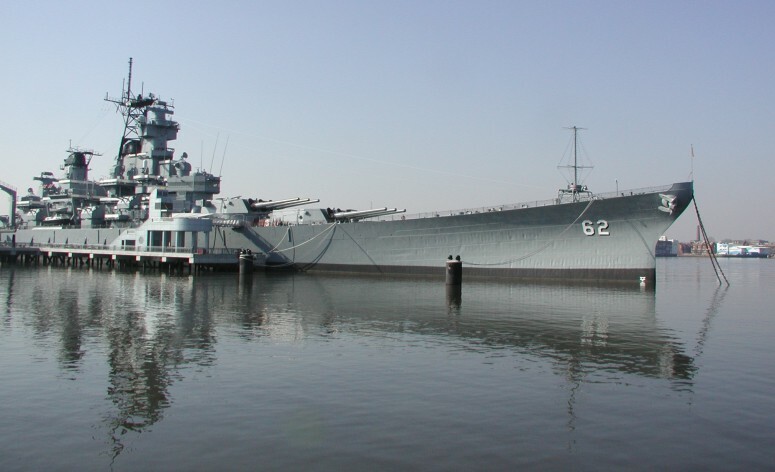 Another organization that worked a long time to bring Big J home is the Battleship New Jersey Historical Society.� These two organizations worked hard to bring the Navy's most decorated warship home to the state she was named for, and I'm proud to be a small part of their efforts. If you're interested in reviewing Photos and entries from a Daily Journal kept during the ships final trip home, click on the Final Voyage button. The Photo Gallery contains photos taken during the ships 4 different active duty periods and an extensive collection of pictures chronicling her final voyage home to New Jersey. It also contains hundreds of photos taken by me over the past 13+ years showing the ships complete restoration, grand opening to the public and ongoing operations. If you want to see a picture of a certain area of the ship, chances are you'll find it in the Photo Gallery, and if not, send me an e-mail and describe the area, and I'll take some for you the next time I'm onboard. Feel free to send me any Comments or Suggestions you may have about this site, I value your input.� If you're interested in visiting websites for other Battleships, other Warships or Naval related sites be sure to check out the extensive Related Links list I compiled while researching for this site.� The list contains links to sites for well over 400 warships and many other Navy related sites. I encourage you to get involved and help this great cause if you can.� You can join the Home Port Alliance for as little as $45.00 per year or you can help in numerous other ways.� For more information about how you can help, click on the You Can Help button.� Even purchasing items from the Home Port Alliance's Ship's Store helps the cause, and the Hats, Shirts and other items there are very nice.� Buy an official USS New Jersey Hat, a T-Shirt or a Golf Shirt and wear it with pride knowing a portion of its purchase price went to help restore and maintain the Battleship. I thank you in advance for any help you can provide to this effort.�� Don't forget to stop by and sign the Ships Log before you leave.� There are hundreds of entries in the Ships Log, many are from former crewmen looking for old shipmates.� Check out the Log Entries and see if you can hook up with an old buddy.� If you too are trying to get in touch with old shipmates, click on the Crew Info button for some helpful hints to get you started on your way.